Southampton host high-flying Watford at St Mary's Stadium on Saturday looking to claim their first win in eight Premier League matches. The Saints have endured a miserable run of form which culminated in their 6-1 thrashing at the Etihad Stadium to Manchester City last weekend; a result which has left them just a point above the drop zone. Watford, meanwhile find themselves in eighth coming into Saturday's game, but are also looking to bounce back after suffering a narrow defeat to Newcastle last time out. With both sides needing the three points for different reasons, check out 90min's preview for the game below. Mark Hughes' major fitness doubt for the game surrounds Netherlands international Wesley Hoedt after the defender suffered a foot infection, which has subsequently kept him out of training. Mario Lemina has been struggling with tightness in his thigh and it remains to be seen whether ​Southampton take a risk on the former Juventus midfielder, but Hughes seemingly will have a relatively full-strength squad to choose from. ​Watford captain ​Troy Deeney returned to first-team training this week and looks set to go straight back into Javi Gracia's starting line-up. With Etienne Capoue suspended after picking up his fifth booking of the season against Newcastle last week, ​Tom Cleverley's comeback is timely, although Gracia will likely opt for Nathaniel Chalobah to replace the Frenchman. Southampton and Watford have locked horns 81 times in their history, with the Saints coming out on top in 35 of those compared to Watford's 26. 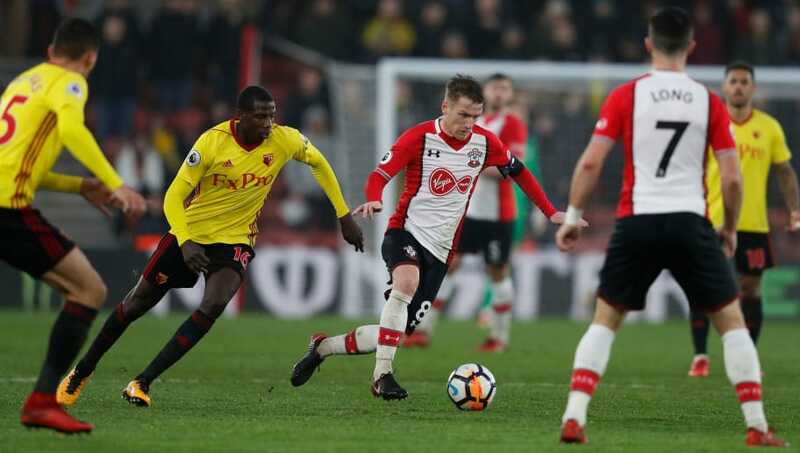 In the 21 home league meeting between the two, Southampton have proven their dominance with 14 wins whilst only once has this St Mary's fixture ended in a draw - a 1-1 tie in August 2016. Hughes' side come into the game on Saturday without a win from their last eight ​Premier League matches, which have included heavy defeats to Liverpool, Chelsea and Manchester City. They have also struggled in front of goal with just one goal in their last six league games, with only four players finding the back of the net this season. After a fine start to the campaign, Watford's form has become inconsistent with a 1-0 defeat to Rafa Benitez's Newcastle side coming after they had beaten Huddersfield 3-0 at Vicarage Road. Gracia's men however do still find themselves in the top half of the table, with a potential win on Saturday seeing them leapfrog both Manchester United and Bournemouth into 6th. With Southampton struggling in recent weeks, and taking a hammering against Pep Guardiola's all-conquering City side, the Saints will likely be low on confidence. Added to their poor results on the field, the departure of the club's vice-chairman Les Reed further complicates the situation at St Mary's. Watford were unlucky not to come away with at least a point against Newcastle and were largely wasteful in front of goal. With Deeney back in contention for a start, the Hornets have every chance of getting back on track in the league with a win away at Southampton.